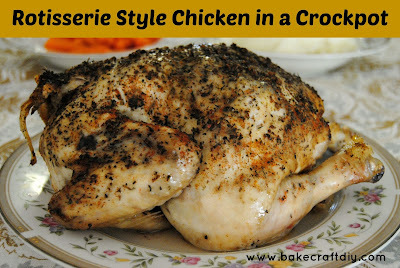 Bake Craft & DIY: Rotisserie Style Chicken in a Crockpot. 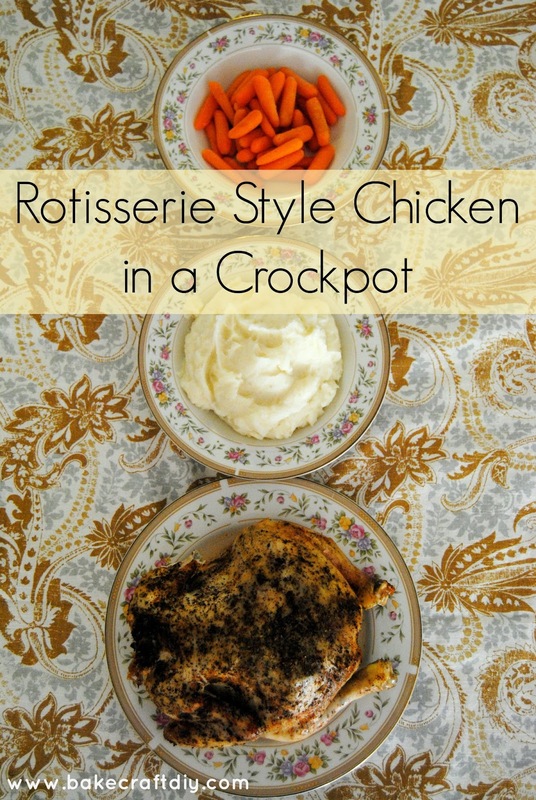 Rotisserie Style Chicken in a Crockpot. My local grocery store had whole chickens on clearance for $2.50! I bought two, one for dinner and one for the freezer... I would have bought more if I had a bigger freezer. After a bit of deliberation and perusing the internet I decided to try a rotisserie style chicken made in a slow cooker. It was so easy and turned out really well, that second chicken will be sent through the slow cooker the same way but then used in a cheesy chicken enchilada dish. Spices of your choosing, I went simple with chili powder, paprika, Italian seasoning, onion powder, and garlic powder. Start by filling your Crockpot or slow cooker with aluminum foil balls, I found twisting it so it was long but thick used less foil but still covered the bottom of the slow cooker. Clean out the inside of you chicken if you haven't already (most come with the neck and giblets inside the body cavity). I dislike the idea of touching the insides, if you feel the same, my trick is to wear a plastic food prep glove; I scoop the insides into my hand and then take the glove off by turning it inside out. Cover your chicken with the butter, I like to get between the chicken meat and the skin you can do this by gently pulling the skin for the chicken. Liberally spice the chicken with the Italian seasoning, paprika, garlic powder and onion powder. If you want to add a bit of spice add the chili powder. To increase the flavors you can add a quarter or two of onion, and a lemon cut in half to the inside of the chicken. 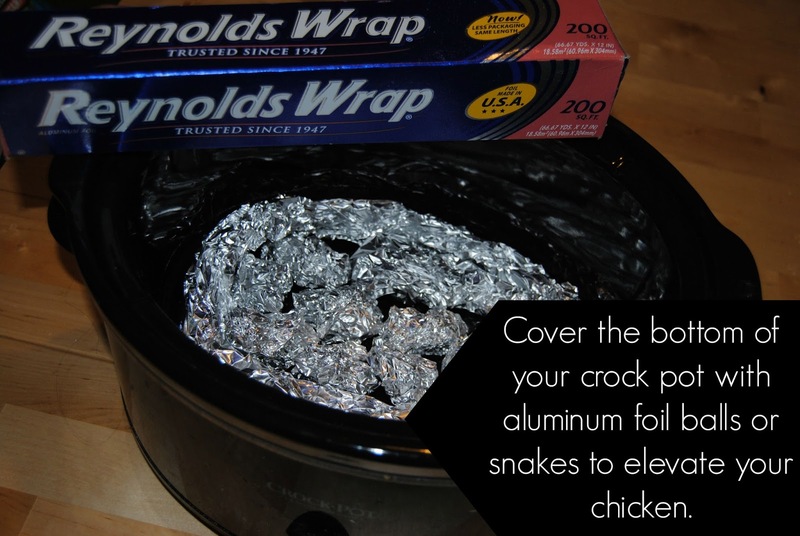 Place the chicken breast side down on the aluminum foil in the slow cooker. Cook on low for 7-8 hours. Checking occasionally toward the end to see if it is done. A cooked chicken should read 165° at it's thickest point, I tend to put my meat thermometer in the fattest part of the chicken breast. When it's done you can leave it in the crockpot to serve, or if you prefer to plate it gently lift it out of the slow cooker. It should be moist and meat may start to fall of the bones when you remove it. My photos were strategically taken to hide the wing that I accidentally ripped off when I was removing my chicken. Maybe this is a way I can trick my husband into eating rotisserie chicken. Looks delicious! I am definitely going to try this! SOON! Sounds great! I love a good crock pot recipe, especially with fall around the corner. Yum!! I'm with you on using gloves. I just don't live cooking with messy bits lol. Pinning this because I love crockpot recipes! You just made my day with this post! I depend on crock pot meals and was getting bored with the same recipes. I NEVER thought that it was possible to do a Rotisserie style chicken. I LOVE it. Thank you for posting this cooking tip to Welcome Home Wednesday! We hope to see you again next week. Yum yum yum! I love a good whole chicken recipe...I am always a fan of things I can let cook and walk away from. Especially when I can make leftovers for days for my little family (3 members but two "big people food" eaters). I'll pin this & I echo the above comment...thanks for sharing with Welcome Home Wednesday!